Interval Training: Good Exercise For All Ages Researchers aren't exactly sure why, but interval training, versus a steady-paced workout, helps people get in shape faster and lose weight more quickly. 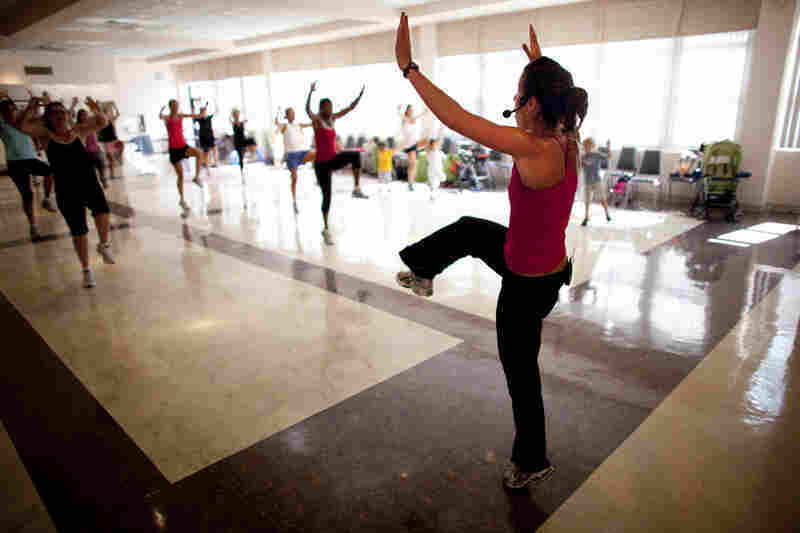 That's the idea behind Mommy Bootie Camp, and experts say the short-burst workouts are great for older people, too. The fitness boot camp craze is evolving. It's no longer just the crack-of-dawn, sergeant-led calisthenics classes. Mommy Bootie Camp in Kensington, Md., packs a lot of punch, with a focus on interval training. Moms meet three times a week at a local synagogue — and many of them bring their kids along. "They have a built-in play date while we exercise," says instructor Kristine Oleson. "Mommy Bootie Camp" is a kid-friendly interval training class, in Kensington, Md. Kristine Oleson leads the hour-long class, which incorporates skipping, jumping and running in place. 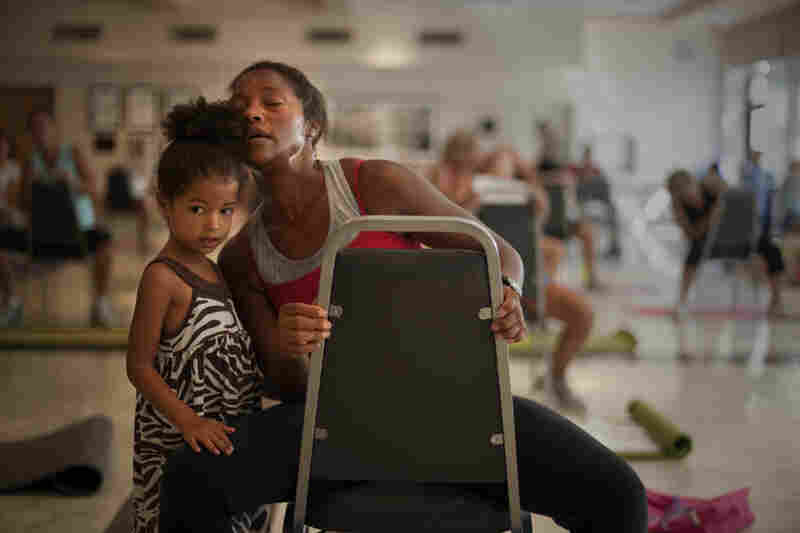 Stephanie Maurer of Silver Spring, Md., attends the workout class with her daughter Riley. Oleson's approach to aerobics is to mix up the pace, increasing the heart rate for short bursts. The goal is to raise heart rates to about 85 percent of maximum and then dial back down to a slow or moderate pace. "Be fierce!" Oleson encourages her students while leading a series of kick routines. Oleson checks her pulse toward the end of the hour-long class. Research suggests that interval training is a quick way to increase your fitness level. Oleson explains that her class has an added benefit for many moms: "They have a built-in play date while we exercise." To maximize the hour-long class, Oleson incorporates a lot of short bursts of high-impact cardio. There's skipping, jumping rope and running in place. "Pick up your intensity," Oleson calls out to her class of about 30 moms as they move through a round of skipping. "Really push it!" The goal is to get heart rates up to about 85 percent of maximum for short clips of time, and then dial back down to a slow or moderate pace. 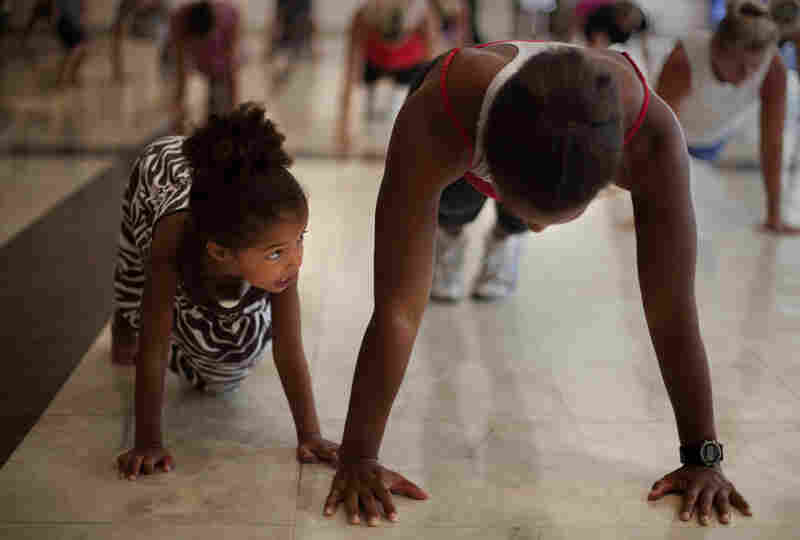 Rosina Aguiar of McLean, Va., brought her kids to the Mommy Bootie Camp workout. "The benefit of interval training is that it's a very efficient way to increase your fitness quickly," says researcher Tim Church of the Pennington Biomedical Research Center. Church says intervals aren't just for athletes and fit moms. Increasingly there's interest in building them into the routines of older folks and those with chronic conditions such as diabetes or heart disease. "This is really a hot area of research," Church says. Preliminary studies suggest there's an additional benefit — beyond the benefits of steady-paced exercise — to mixing in some interval training. Researchers in Australia have tried to find the most effective pacing for interval training. They're focused on bringing the approach to folks who are pudgy around the middle and older than 40. "Everybody can do 8-second sprints," says Steve Boutcher, a professor of exercise science at the University of New South Wales. His studies have documented the benefits of 20-minute workouts on stationary bikes. Participants cycled three times per week. They alternated between 12 seconds of slow, gentle peddling and 8-second intense sprints, peddling as hard as they could. "In the 20-minute bout," Boutcher says, the actual hard exercise totaled just 8 minutes, "so it's not that much exercise." But the payoff was significant. Over the course of four months, participants lost an average of 6 pounds of body fat. By comparison, those who cycled at a steady pace for 40 minutes, without mixing in the interval sprints, lost less than 2 pounds. Researchers are not certain how to explain this difference. But Boutcher is studying the role of chemical compounds called catecholamines. Boutcher says our bodies seem to produce higher levels of catecholamines during sprint-type exercises that elevate the heart rate. "These are hormones that tell the fat cells to release their fat," Boutcher explains. If cycling doesn't interest you, Boutcher's advice is to try swimming, rowing or stair-climbing. If you like to walk, throw in some hills at a faster clip — anything to mix up the pace. But it's also important to recognize your limits, and to start out slowly. "I'm a huge supporter of interval training because I think the payoffs are great," Church says. "I mix them into my workouts on a weekly basis." But he cautions that people need to be careful. "We see men who are 45, and they've been sitting at a desk for the last 15 years, and they want to start doing their high school football workouts again," Church says. They don't realize how out of shape they may be. Church advises people to check in with their physicians before starting any intense interval training, especially those who are managing a chronic condition. After years of running, mostly at a steady pace, the interval approach emphasized at Mommy Bootie Camp is paying off for one regular in the class. "I think it increases stamina, and it does seem to help with weight loss," says Kathleen Sylvester, who brings her two preschool-age children with her to class. 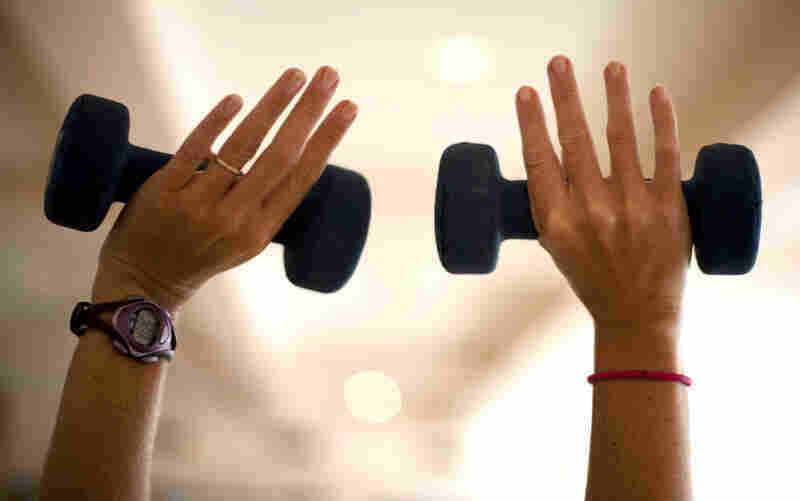 She says interval training has also helped her build long, lean muscles. One other reason she keeps coming: The baby-sitting is built-in.